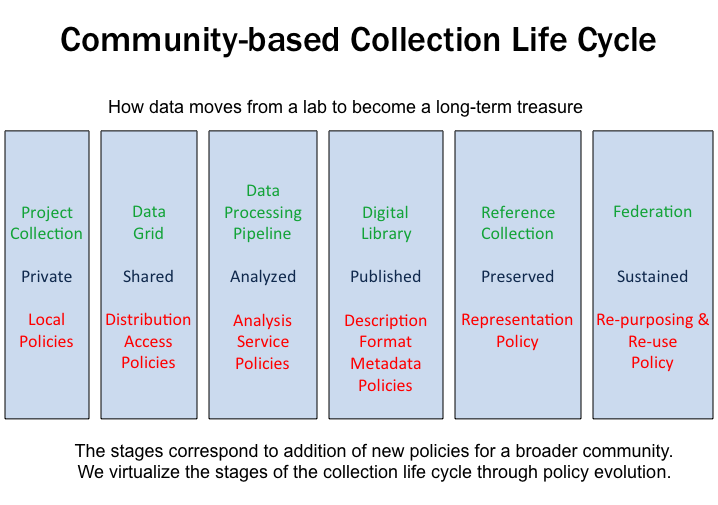 The DataNet Federation Consortium recognizes a community-based collection life cycle. For each collection that is assembled, there is a driving purpose. Examples might include a data sharing environment for collaborative research, a digital library for data publication, or a data processing environment. By adjusting the governance policies and procedures, the DataNet Federation Consortium infrastructure can support each stage of the collection life cycle. You can download the iRODS data grid from http://irods.org and build your own data grid. You can federate your data grid with the DFC Federation Hub. This enables collaborative research initiatives to span multiple independent data grids. You can use tickets to formalize access to data within the DFC Federation Hub. This enables access to data from external data management environments. You can select between 50 clients for accessing data and workflows within the DFC Federation Hub. The clients include web browsers, web services, digital libraries, file system interfaces, load libraries, I/O libraries, Unix shell commands, grid tools, Dropbox interfaces, portals, and workflow systems.